Why Buy Split System Air Conditioner Systems? The split system air conditioner is the first thing that comes to mind for home owners when they look into installing air conditioning for their homes. This is because the split air conditioner is the poster child of the air conditioning industry during it’s formative years. There are many brands of split system air conditioner systems for sale on the market. From the more premium priced ones like Mitsubishi Electric, to Toshiba & Carrier, to Samsung, one would be spoilt for choice. Today’s split system air conditioning systems have all gone through years of refinement and technological advancements. This means that no matter which brand you choose, you will get a good quality system. Barring any unit specific faults. Jim’s Heating and Cooling supplies and installs homes and commercial properties with superior quality split system air conditioners. We provide professional advice to Adelaide home owners to ensure they choose the right brand and system size for their homes. There are many benefits to installing a split system air conditioner for your home. Below are just some pertinent ones that you may consider when considering which type of air conditioning to install. Installing a split system air conditioner is quite straight forward. Air conditioner companies normally only require 3-5 hours to get it done. A main compressor unit is installed (usually tucked out of sight at the back of the house) and wall units are installed into each room that requires air conditioning. Split system air conditioners are one of the cheapest air conditioning units to install. Starting from as low as $600, you could get a single unit installed, or go up to a 4 or 5 unit system size. Depending on your needs. Split system air conditioner units are very easy to control. A feature rich remote controller allows the user to manage every aspect of their air conditioning. From climate settings (temperature, fan speed, direction flow, etc) to timer functions to power settings…one could create the ideal climate for a home easily. Split air conditioners are also very easy to maintain. A periodic cleaning is all that is required to keep it running smoothly. Maintenance just involved vacuuming the fan grills, cleaning the air filters and applying an air conditioner spray – on each wall unit. Split system air conditioners these days all come with the reverse cycle function. That means, they can produce both hot and cold air. This makes them an all in one air conditioning system that can keep your home warm in winters and cool in summers. Now instead of installing separate gas heating, you could just install a reverse cycle split system to take care of all the heating and cooling requirements for your home. If you have a standard sized 2-3 bedroom home, a split system air conditioner would be ideal for your home. Just install a wall unit into each room you wish to air condition and you’re set. If you have a larger house though, and harder to reach spaces, you may want to look at a ducted air conditioner instead. Ducted air conditioning uses a network of ducts to distribute air. These ducts can be run into many rooms (for large homes) and can service multiple floors of a home. Making a ducted air conditioner more suited to larger homes. 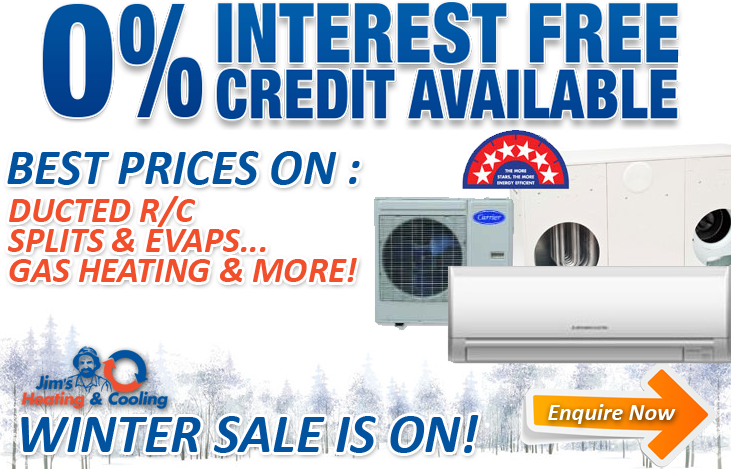 Need a good deal for a split system air conditioner? Click here to request the latest split system air conditioner deals from Jim’s Heating and Cooling. Split system air conditioning is usually a good match for any home. It is a very versatile option that can fit most home layouts and requirements. Contact our friendly team of staff on 131 546 or submit a quote request here if you would like to arrange for an efficient split system to be installed at your home or commercial property.